Just because it’s almost Spring doesn’t mean soup season is over! 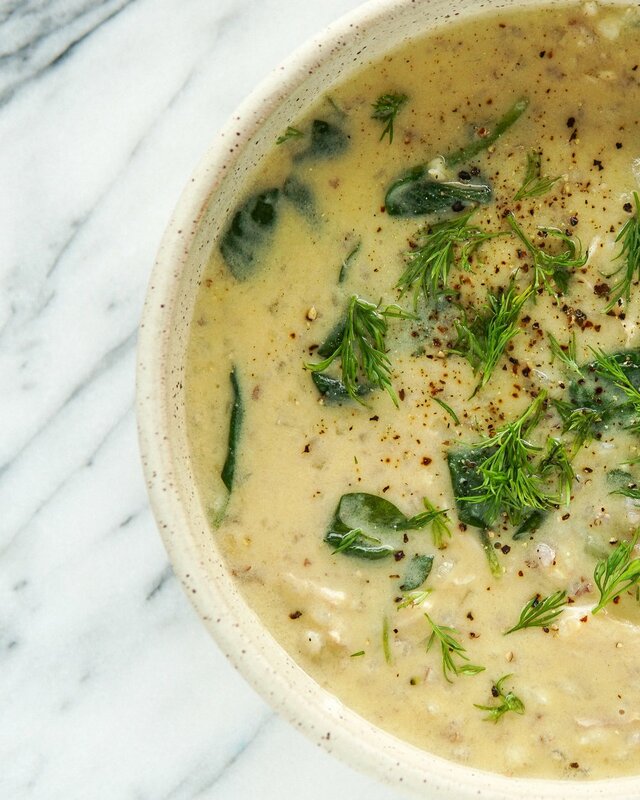 This creamy, bright, lemony soup will blow your mind with it’s simplicity and deliciousness! Also known as Avgolemono, this traditional Greek soup is a fun twist on chicken and rice soup. It has a secret ingredient that makes it extra luscious — eggs! No dairy, just eggs to create a creamy, velvety consistency. The soup is topped with a generous amount of fresh dill for a herbaceous punch and black pepper for lil a kick. Can you put raw egg in soup? YES! Slowly stirring in hot water tempers the eggs, sort of like chocolate, so that it doesn’t scramble. Instead, it cooks slowly at a lower temperature. It’s a family of Greek sauces and soups where eggs/egg yolks are combined with lemon juice and hot broth to create a creamy sauce or soup. What kind of rice is best for soup? You can totally use white rice or even quinoa instead of brown rice. I just like the heartier texture of brown rice. Don’t worry about overcooking the grain, it adds to the creaminess. In a large pot over medium heat, warm the olive oil. Add onion and 1/2 tsp salt and cook until softened, about 5 minutes. Stir in the rice, bay leaf (if using), chicken and chicken stock. Bring to a boil, then reduce the heat to low and simmer for 20-25 minutes (uncovered), or until both the rice and chicken are cooked. Remove the bay leaf and transfer the chicken to a cutting board. Use two forks to shred the chicken. Return the chicken to the pot along with the spinach (if using). Simmer until the spinach wilts, about 2 minutes. In a medium bowl, whisk together the 2 whole eggs, 2 egg yolks and lemon juice until smooth. VERY slowly pour in 2 cups of the hot broth while whisking constantly. Stir the lemony egg liquid back into the soup along with the remaining 1/2 tsp salt. Simmer it gently for a couple of minutes. It will become creamy — MAGIC! Taste and add more salt if you think it needs it (depends on the chicken broth used). Stir in lots of cracked pepper. Serve topped with lots of fresh dill, a drizzle of olive oil and more black pepper. Slowly whisking the hot broth into the egg/lemon is the most important part! It’s not hard at all, just maintain a slow drizzle while whisking away. The chicken may cook faster than the rice. If so, you can just remove the chicken and continue to simmer until rice is cooked. The soup is very lemony and salt helps to balance it all out. Don’t be afraid to add more salt if you think it needs it. A drizzle of olive oil also helps balance the lemon. Don’t skip the DILL!!! It takes the soup to the next level. This Spiced Chickpea and Sweet Potato Stew is loaded with some of my favorite cozy spices to use this time of year. The coriander, cumin, turmeric, paprika combo will warm you up from the inside out! The bites of sweet dates and salty olives combined with the spicy broth is to die for! BONUS — it’s loaded with immune-boosting foods to keep those nasty winter bugs at bay. Lentils and chickpeas are my favorite legumes to use as plant-based options for dinners and lunches. While I love eating local, grass-fed, pasture-raised, etc… meats a few times a week, I try to make the majority of my meals plant-based for simplicity, affordability, and variety. 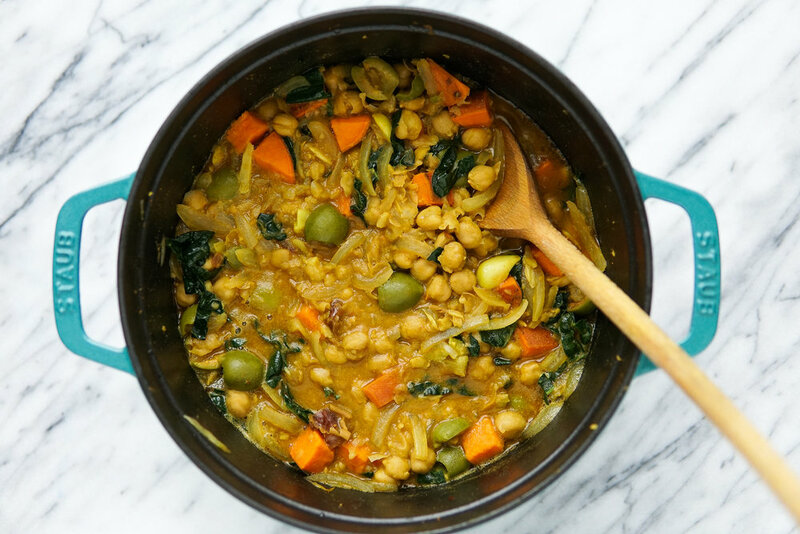 The moment I tested out this chickpea stew, I knew it was going to be a weekly staple. It’s super easy to throw together — simply sauté some onions and garlic, add your spices and chickpeas, mash them up a little to thicken the stew, then add the rest of the ingredients and simmer until done, voila! I make a ton of stews this time of year because they keep well in the fridge or can be frozen for an easy meal. Make a double batch and freeze half, you won’t regret it! Whats the difference between a soup and a stew? Soups have much more liquid, whereas stews are meats, legumes, and/or veggies that are simmered with enough broth to cover/cook until everything is tender and the broth is reduced and turned ‘saucy’. Yum! How do you make a vegetarian stew? Swap the beef, poultry or pork with some good old reliable legumes! Sauté your aromatics and spices/flavors, add the protein and liquid and simmer until everything is tender and liquid has reduced. In a large pot, warm the oil over medium heat. Add the onion, garlic and salt and cook until softened, about 5 minutes. Add the coriander, cumin, paprika, turmeric and red chili flakes (if using) and cook for 30 seconds, stirring constantly, to toast the spices. Stir in the chickpeas, then use a fork to mash about ⅓ of them up. Stir in the sweet potato and water and simmer, covered, for 10 minutes. Stir in the greens, olives, and dates and simmer, uncovered, for 5 more minutes. Serve with rice or quinoa and garnish with cilantro and almonds. This is also delicious with a dollop of plain yogurt! Make sure to mash 1/3 - 1/2 of the chickpea to help release their starches and thicken the stew (thanks Alison Roman for the tip!). Some canned chickpeas are way creamier while others can be a bit mealy and dry. You definitely want CREAMY to thicken up the stew. I love the 365 brand from Whole Foods. If you cook your chickpeas at home (this yields the best chickpeas by far), then use 4 cups cooked chickpeas! Toasting the spices enhances their flavor, so don’t skip that step! But be careful not to burn them — stir it constantly and make sure there is still some oil in the pot. If not, add a glug. You still want the final product to have some liquid/sauce but not so much that it’s like a soup. Keep reducing the liquid (or add some) until it seems right. Make sure you taste and add salt/spices/maybe some lemon juice until you like it! Gluten free, paleo- friendly chocolate chip cookies with the perfect soft, chewy texture! One of my favorite fall activities is wandering amongst the apple trees with Mt. Hood in the background and a hot apple cider in hand. There are so many amazing apple orchards in Hood River with beautiful views of the mountain, it’s magical! 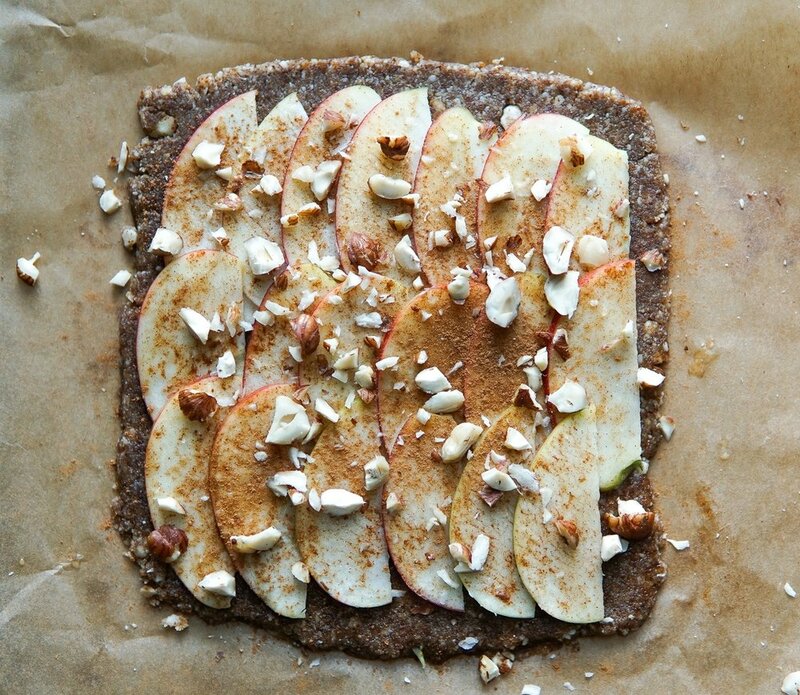 We obviously came home with an abundance of apples and the only logical thing to do is to bake a healthy apple treat, am I right? This one was inspired by my momma! When we were kids, my mom would always make these German tarts with whatever fruit was in season. In the fall/winter it was apples or pears and in the summer it was peaches or plums (my fav). The original dough is a super simple tart dough, but loaded with refined sugar and flour, so I ‘health-ified’ by substituting almond flour and coconut sugar. The texture came out soo good — crispy yet slightly chewy and delightfully nutty! What is a German Apple Tart? I asked my mom what the German name was for the recipe and she said ‘Apfel Schnitten’. I googled it and a ton of different looking recipes came up. We called it German apple tarts as kids so that’s what I’m calling it! Essentially it’s just a pie-like crush topped with fruit and nuts and baked until golden. 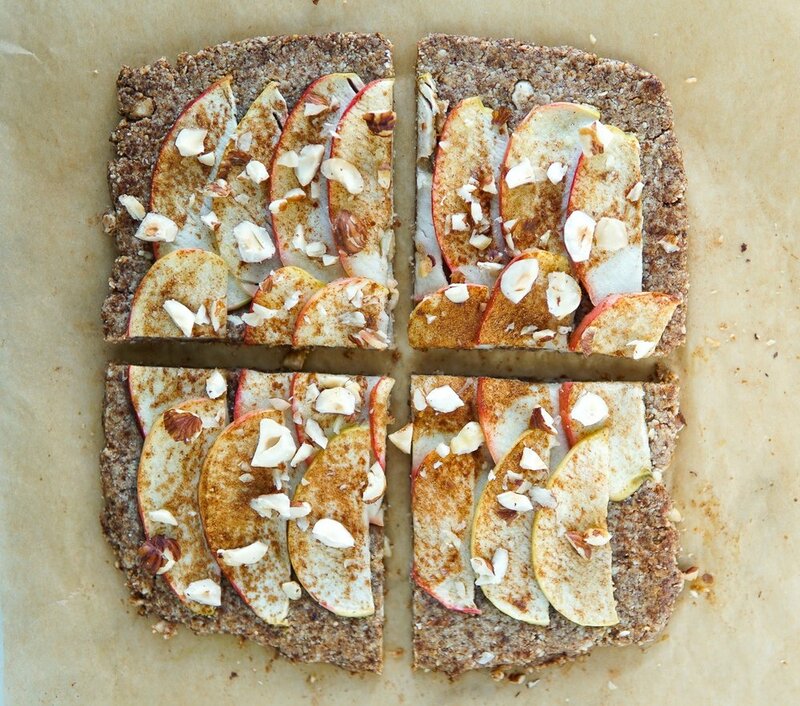 Which apple is best for baking? I prefer using tart apples like Granny Smith, Empire, or Elstar but a sweeter variety like Honey Crisp works well too. You want to use an apple that is firm and crisp. A lot of it is just personal preference. 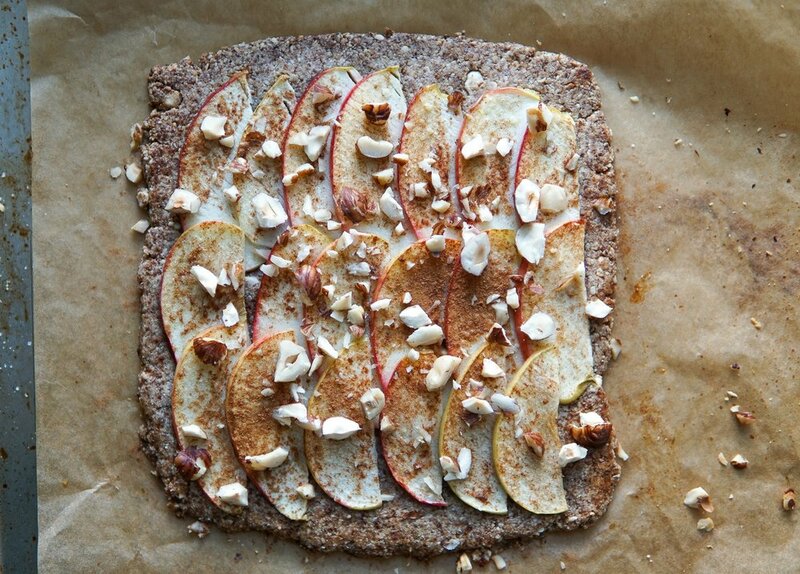 How do you make an apple tart? In a bowl, mix together the almond meal, coconut sugar, coconut oil, egg yolk, vanilla and salt. Use your hands to knead the dough to make sure everything is evenly mixed. Form it into a ball. Place the dough on the parchment-lined baking sheet and press into a square shape. Use a rolling pin (or wine bottle!) to roll the dough out until it’s about ¼-inch thick. Layer the apples on top of the dough and gently press them down. Use a brush (or a paper towel or napkin) to spread a thin layer of the egg wash on top of the apples (helps them get nice and brown). Sprinkle with cinnamon and top with chopped hazelnuts, if using. Bake for 25-30 minutes, or until the edges of the dough are deeply golden. Serve warmed topped with vanilla ice cream! I also enjoy it for breakfast cold or warm with plain whole milk yogurt on top! If you don’t have a rolling pin or wine bottle you can just use your hands to press out the dough, it just won’t be as uniform. Don’t press the apples into the dough too hard, just gently so that it makes contact. When it bakes, the apples will stick! The egg wash helps the apples to get a little golden, but you can skip this step, it doesn’t change the flavor. I used homemade almond meal (just almonds blended in a food processor). You can use store-bought almond meal or the finer almond flour (haven’t tried with almond flour but it should still work). I made the recipe to serve 4, but you can easily double it for a crowd! Store in the fridge in an airtight container. Reheat in the oven or microwave. This will keep in the fridge for 1 week, but I promise it won’t last that long! Now that fall is here all I want to do is eat soups, stews and roasted everything! 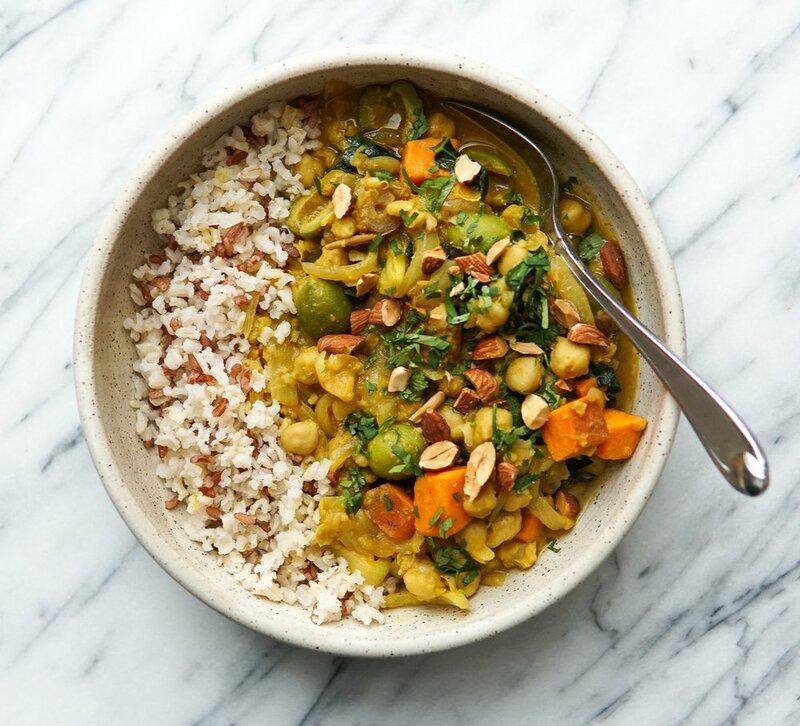 This Chana Masala is a tomato-based chickpea stew that is full of warming spices and flavors. I love this recipe because it uses super simple, budget-friendly ingredients, and is a delicious, comforting plant-based dinner option that also freezes really well! This recipe is very dear to me because I got it from one of my best friends mom who used to feed me A LOT of Indian food back in high school. I’ve never had anything quite as good since! How do you make chana masala? First you pulse the jalapeño, garlic, ginger and onion so that everything is very finely chopped. Then you toast the spices in shimmering oil, which blooms them and makes it super fragrant. Next you add the onion mixture to the pot and let them caramelize a bit. Then you add the pureed tomatoes and cook that for a bit so that it thickens. Finally, you add the chickpeas and remaining spices along with spinach (if using) and then stir in the cilantro. Easy peasy!! What is chana masala curry? It is an Indian curry made with ginger, garlic, green chiles, onion, tomatoes, a warming spice blend, and chickpeas. It’s very simple yet super satisfying! You’ll need a few spices for the delicious spice blend, but if you don’t have them they are totally worth investing in. Here is what you’ll need: cumin, coriander, turmeric, garam masala, and paprika. Is chana masala good for you? Yes!! It’s loaded with anti-inflammatory spices like turmeric and ginger. Since it’s a tomato-based stew, it’s high in vitamin C and carotenoids that are also great for reducing inflammation. The chickpeas add a healthy dose of fiber and protein. Add some spinach for an extra boost of calcium and iron! In a food processor, pulse the jalapeño, garlic, and ginger until everything is finely chopped. Add the onion and pulse again a few times until finely chopped. This step really helps to finely chop and release the juices for maximum flavor. In a large pot, add the oil over medium-high heat. Once the oil is shimmering, add the spices and let them toast in the oil for about 1 minute, stirring often. Add the onion mixture and salt and cook for 5 minutes to let the onions cook down and caramelize and spices continue to release their flavor (this is key for a deep, rich flavor). Add the tomatoes and simmer for 5 more minutes to thicken. Stir in the chickpeas, garam masala and paprika and cook for 5 more minutes. Stir in the spinach (if using) and cilantro and let the spinach wilt (if using). Remove from heat. Serve on top of a bed of basmati or short grain brown rice. Enjoy!! Make sure not to skimp on the oil. It allows the spices and flavors to bloom and gives the stew a rich, satisfying mouth feel. Don’t skip any steps! Caramelizing the onions, toasting the spices and simmering the tomatoes are all KEY to a delicious chana masala. You could try hand chopping everything if you don’t have a food processor. I haven’t tried it this way but am sure it will still be delicious. However, pulsing them released the juices from the garlic, ginger, etc… and leads to a better smooth texture in the stew. This will keep in the fridge for up to 1 week and freezes for several months! I always have some little bags of cooked grains (brown rice, farro, barley…) in my freezer so meals like these come together super quickly! Simply microwave the grains until warm or let them sit in the fridge overnight to thaw.